M-Ticket was a trial by Dutch transport company Noordned. Passengers used a text message on their mobile phone as a transport ticket. It was originally a 6 month trial between September 2002 and May 2003. The purpose was to test if passengers would be interested in using a mobile phone as a transport ticket, but also to test if it was commercially viable. About 500 passengers on one bus line and three train lines took part in the test. At the end of the trial only 100 passengers still used the M-Ticket. Noordned considered the test a succes and decided to extend the service to all its bus and train lines. In this project Noordned cooporated with Rabobank (a bank), Vrije Universiteit Amsterdam (a university), CMG (an IT-company) and Connekt (a knowledge platform for traffic and transport). This system had several advantages. Passengers could buy a ticket at any moment at any place without having to wait in line. There were several advantages for Noordned as well. Up to this point tickets were only sold by their competitor Dutch Railways. Noordned's own ticket system would ensure that no hefty commission had to be paid for the sales of their tickets. It would also give them valuable data on their passengers and their trips. Data they had no acces to until then. The project ended succesfully in 2005. Arriva, which had taken over Noordned, prefered the new ov-chipkaart and considered having a second system as "not useful". Firstly a passenger registered with NoordNed as a user. The passenger, now a registered user, ordered a transport ticket calling a free voice responsive order line or online via a website. After the order was placed, on the day of travel the passenger received a text message on his phone which he could use as a transport ticket. A passenger could order a single or a return ticket. Day tickets for children, bicycles and dogs were also available. Payment of the journeys was through direct debit. Noordned deliberately avoided placing the fare as a deduction on the telephone bill. They wanted to introduce only as much new technology as needed for this project. At that time there was also a low maximum amount that could be deducted from a telephone bill. Most tickets would have been more expensive. The service staff used a portable handheld, a Compaq PDA Model iPaq 3870, to read the tickets. This PDA is linked to a central database, called Mobile Ticket Service, via the mobile GPRS network. Staff also had a Nokia 6310i mobile phone which enabled the GPRS connection. Communication between the PDA and the mobile phone was via Bluetooth. 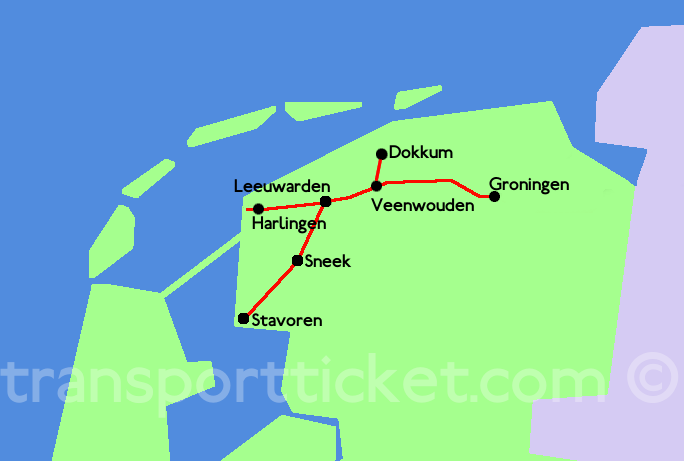 In 2003 the service was extended to all Noordned's bus and train lines. Research conducted by the Vrije Universiteit Amsterdam showed that for 75 percent of the passengers the M-ticket met the expectations. 19 percent was even very satisfied. A quarter of the passengers indicated that they rather bought a paper ticket from a ticket machine or a ticket office.